We all laughed when they banned it a few months ago, saying that it'll never work, that the cat's outta the bag, the horse has left the barn, the ketchup's outta the bottle. We thought that the Lipa concert ban back in '08 was the proof that bans never work. All the pundits told us so, and they thought that this was the last cry of the zealot. But we underestimated the fact that there are lots of people with time on their hands that have no problem harassing advertisers, telling that the Rabbonim will come out against them for advertising with VIN. 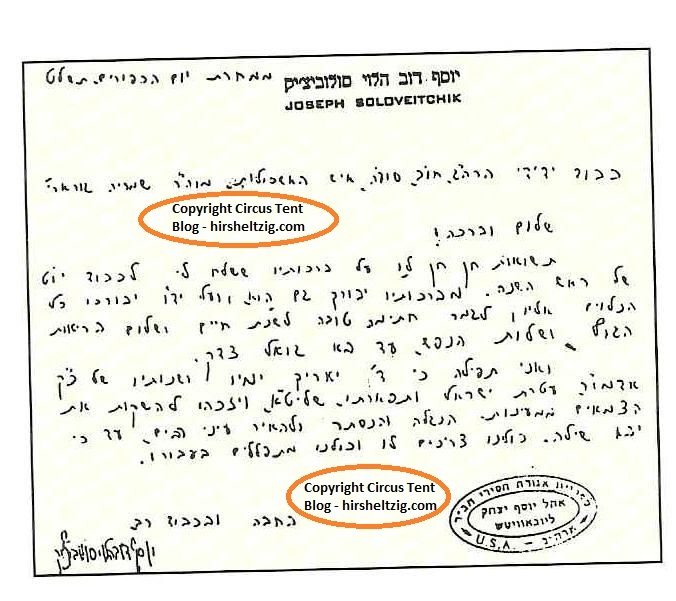 I speak from experience with at least organization that was harassed and maybe even threatened that if they do not take down their ad from that site that the Rabbonim will be informed, and that the Mossad will lose its Rabbinic protection - which it very much needs, due to the nature of the activities that it engages in. Sure enough the ad was down soon after that phone call. 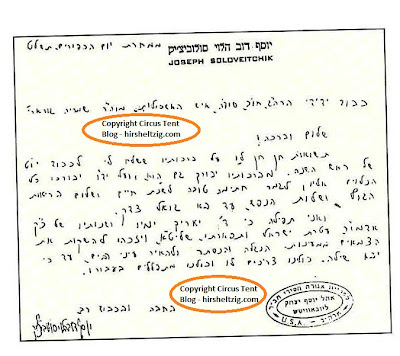 They too were not aware of the fact that K"K was a serious one, and that the site was being watched by "Askoonim." It was that incident that made me pay attention more to the news and advertising content of VIN, and I soon saw what any of you can see, if only you pay attention closely. Satmar has always "suffered" from this affliction; they always knew what the other guys need to do based on what HIS seforim say. 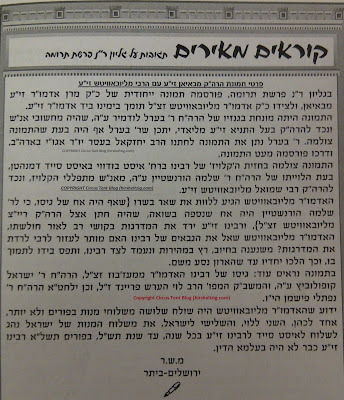 Like I was told recently in a comment, that I should "l'shitoscho" when arguing a point, and that Satmar does it very well. They tell the Lubavitchers what the Rebbe Rashab wrote, and the Belzer what the Rebbe Reb Soocher Dov held. 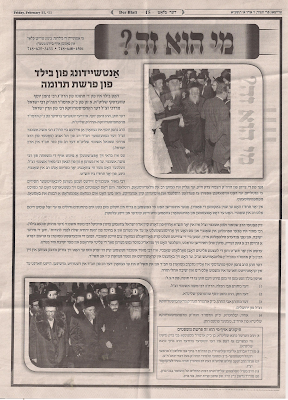 The SatmarRov tried to convince his son, The Holy Reb Ahron Belzer that he wasn't acting in accordance with what "Belz" had opined pre-WW2. 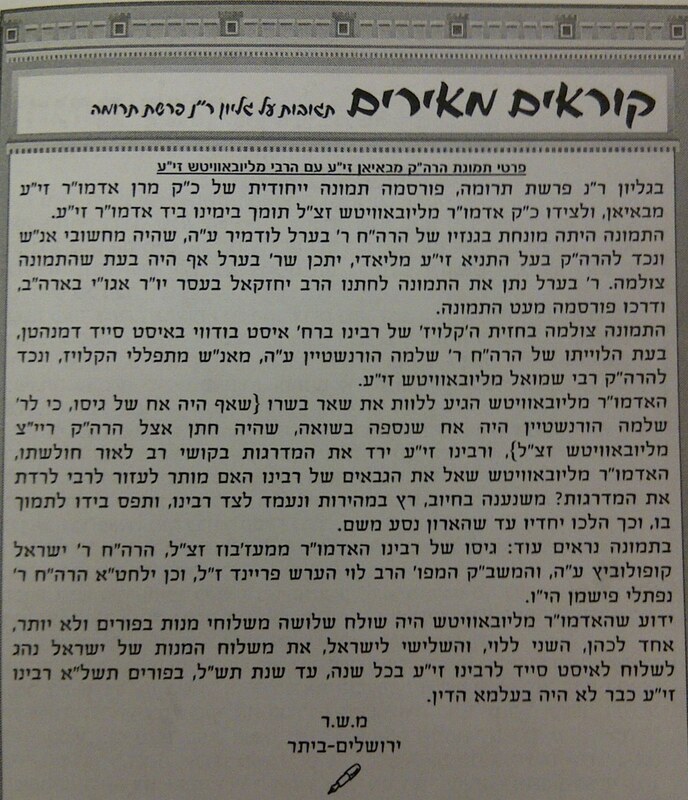 Recently the Belzer אור הצפון publication has irked the Satmarer more than usual, and they decided to take action and attack. They used their "big dog," Menashe Fulop, who they all loved when they were all one team, but npw that he's on the "Zali" side has very few admirers left. The circular and irrelevant arguments and logic used here should be made into a case study of how NOT to argue an issue, question like "ווי קען מען זאגן אזא זאך אויף דער הייליגער רבי ישכר דוב?" and others like that don't win arguments in the face of facts on the ground, but that doesn't keep them from "keeping on keeping on." All because "זיי פארשטייען בעסער"
a.k.a. 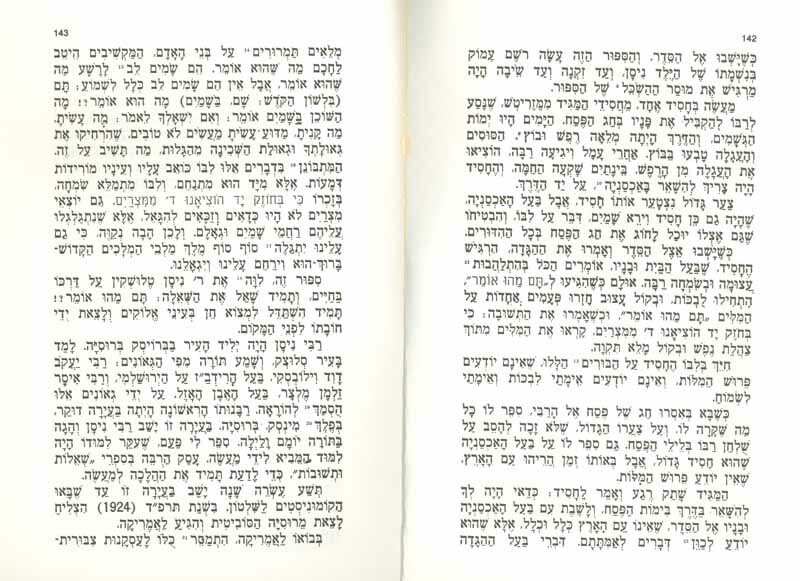 Rabbi Freifeld's Rebbe, those of you who read Yisroel Besser's classic know about Rav Telushkin and how he and his shul in East New York Gubernye influenced young Shlomo. and yes, er hut gehalten fun Rebben.... I say that because I know somebody will bring that up, so I head him off at the pass. It's busy season at the moment, so you'll need to excuse my slow pace of writing these last few days and weeks. For now, take this. 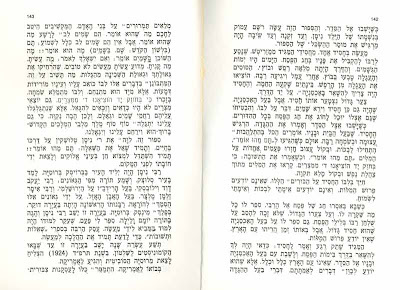 It's interesting to note that RYBS would write these words in a letter to RaSHaG, not the Rebbe... 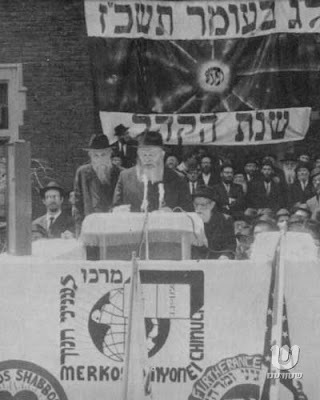 Which makes doubters like his son Hayyim and others look silly when they say there was no connection and that Lubavitch propagandists were the ones to "create" it based on circumstancial evidence. 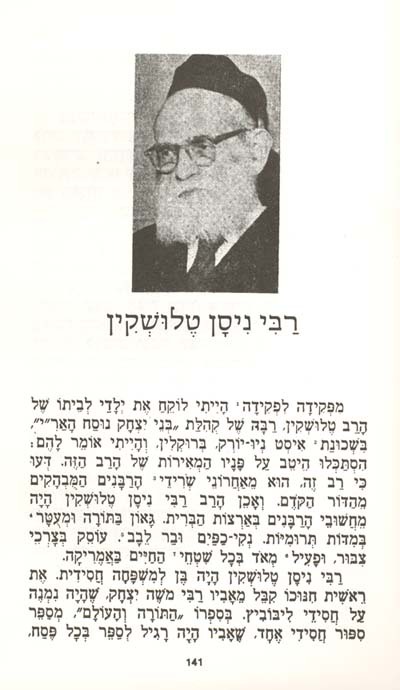 It would seem that RaSHaG probably wrote about the Rebbe in his letter to RYBS, but I could be wrong. Are all the facts listed here correct? Anybody? I did not know that the Horenstein to whom's levaya the Rebbe went to the East Side was Mendel's brother. 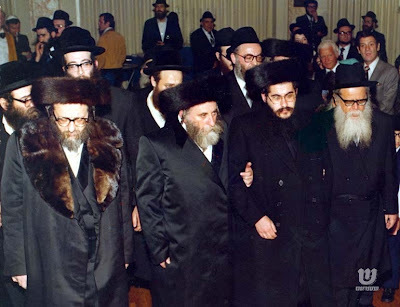 I also think that the Rebbe was so concerned about whether or not the Boyaner Rebbe - or Chassidim, rather - allowed for their Rebbe to be touched, shows his concern and respect for the minhogim of other kreizen, as well as the privacy of another human being - if I may so myself. "The Rabbi of the Homeless"
Rav Yehuda Tirnauer, z"l, with a meshulach in the YCS lunchroom, circa 1959. 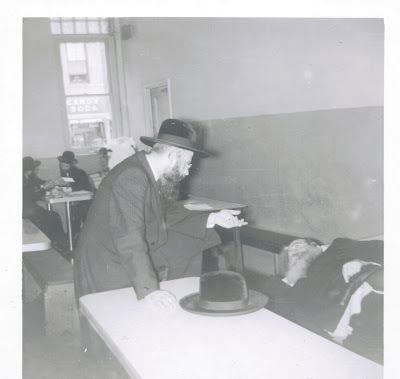 The young man on the right, in the background, is Reb Nissen Neiman, Vizhnitzer Dayan. The man who sent me this picture, sent it on the condition that I name this thread like that, "The Rabbi of the Homeless." At first we thought that this picture illustrated that idea perfectly, but then he realized that it was a meshulach resting on the bench after a filling lunch. 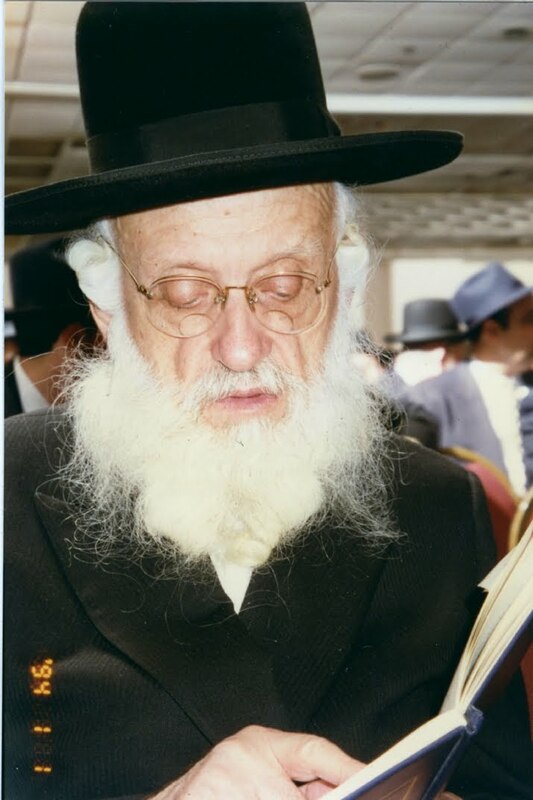 I wasn't aware of that aspect of Rav Tirnauer, who passed away 2 weeks ago, despite me growing up in BP, and despite the fact that my zeide would attend his shiurim daily after he retired. But this is the case, apparently. 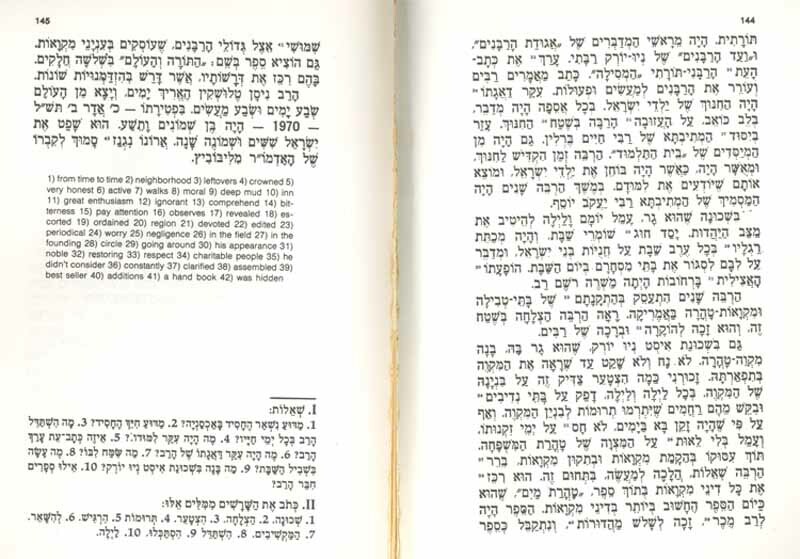 In Yeshiva Ch'san Sofer on the LES, many of the bachurim were either born during the war or immediately after, and some had parents who could not relate to them. These boys needed a man who would listen to them, and RYT was the man. And that relationship lasted for decades and spanned generations, not just while they were in Yeshivah. Many of these men continued to seek and heed his advice even when dealing with their own children and the issues that arise with raising them. 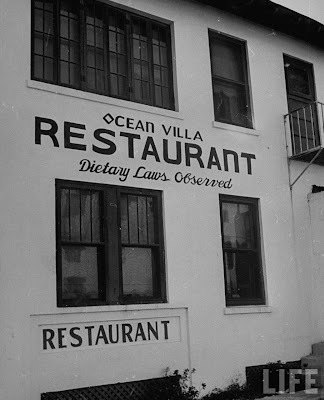 Which makes you think that maybe the fact that so many homeless Jews found a quasi-home in the basement of Shomrei Shabbos shul, where RYT was Rov, was no coincidence after all. 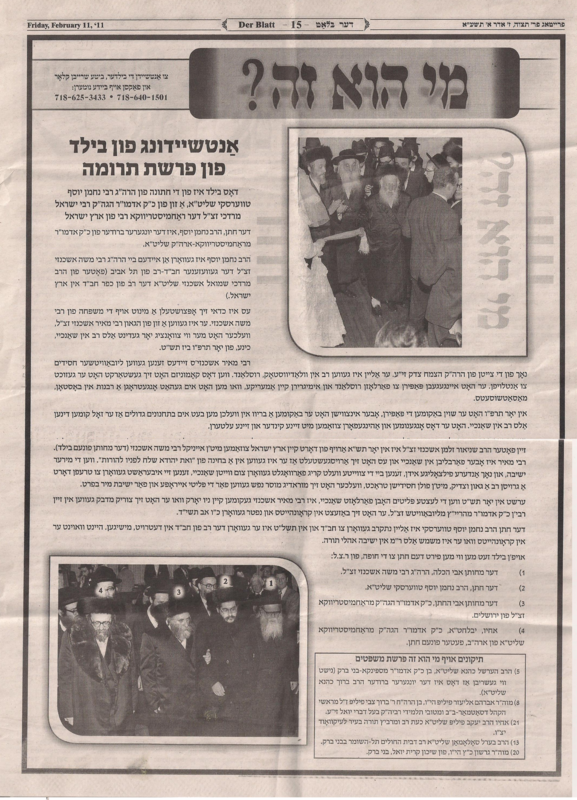 A clipping from last week's "Der Blatt" newspaper, published by the "Aron" faction of Satmar, where they bring a picture and ask you to solve the puzzle. I think I know who the current picture is from as well, but let's focus on the picture at the bottom of the page, the one that they describe here, very nicely, if I may say so myself. We brought that picture a while ago and discussed the wedding a bit then as well. "מפי עוללים ויונקים יסדת עוז, להשבית אויב ומתנקם"
Now, you too can waste precious time better used to learn Torah, spend time with family or make money and plan the personalized license plate you know you'll never get because you're too cheap, or simply don't have the cash! Just remember, many of your dream plates are already taken or are not allowed by the DMV... I chose to display here many of the topics that we discuss here on the tent, whether very recently or in general. I know, I know, I could've done hundreds of different things too, but I don't have that much time. Send us in your suggestions, pictures, that is, and we might just publish them! I actually saved some more plates, and maybe I'll add some later, who knows? The Author of the Tolner Wikileaks as he was - and is known in Ger, even after becoming Rebbe, and especially now that he's embarrassed them for all eternity. Last of the Kopusters... And where Lubavitch got lots of Chassidim from. It's not really alive, is it? I should get a set..
Srool or Mendel, which one do you like? Or are you Monsey? 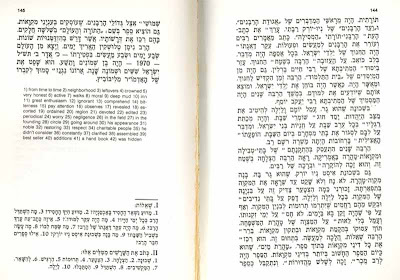 The Tumene Tziyonim - fechie. An old time talmid of Reb Aron - or a wannabe from Lakewood. כל השביעין חביבין - and now we know in Ger too! Not to be confused with Spinka 56, or maybe it's the amount of Spinka Rebbes? His whole being is "anti"
The "Anti-Tzemach" is no more.